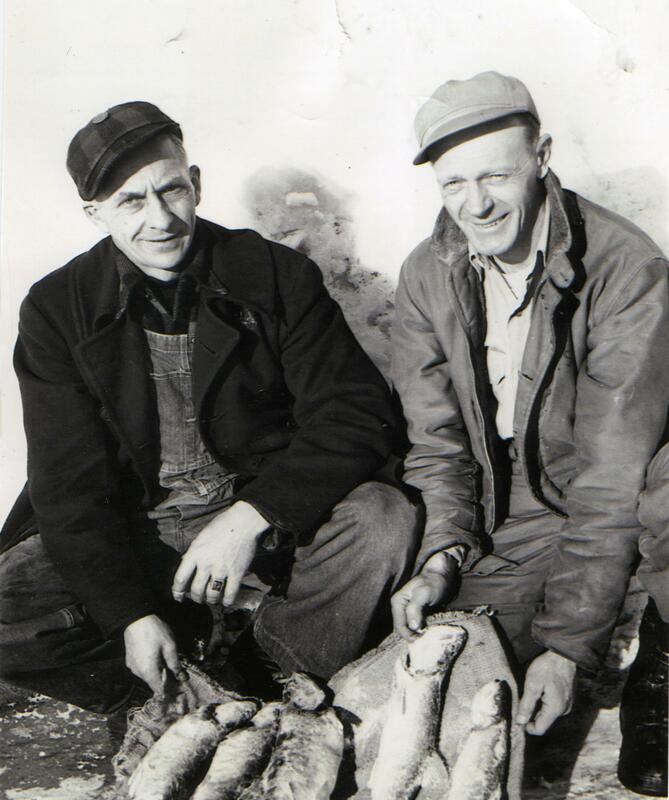 Vern Frechette (left) grew up in Chequamegon Bay. The morning of March 9 looked like a pretty good morning to get out on the ice. Vern Frechette had been born and raised on Lake Superior’s Chequamegon Bay, and knew it better than most. He was familiar with the unpredictable waters between the Apostle Islands, and fished often in the summer and winter. That fateful March morning, Vern, his brother George, and friend Oscar Holman headed out on the ice in a Model-T between the northeast end of Madeline Island and Michigan Island. About 10 other men from Washburn and a handful from Ashland were also on the ice that day. Store-bought hooks were rare back then so hooks were sometimes fashioned from the tines of a pitchfork. Frechette said the hooks didn’t have eyelets on them, so they would wrap the line around the end of a hook and seal it with nail polish. With a heavy cone-shaped sinker and cut up herring for bait they were ready to fish. Trout fishing on Lake Superior ice in early March was serious business. But the threat of a storm coming up from the southwest was serious business too, and when the wind began to blow across the ice the Frechette brothers knew just what to do – pack up and get to land as fast as possible. But as they drove the Model-T towards Long Island and safety, the storm intensified surprisingly; temperatures plunging and a driving snow developing. They suddenly saw an open stretch of water running south from Madeline Island, growing steadily wider. The Frechette brothers and the 27 other fisherman out on the ice that day had become trapped on an ice floe that was being blown out to the open lake by the intensifying storm. Their lives were in jeopardy, and everyone knew it. Stopped at the edge of the floe, looking towards the island that now seemed so far away, the three men saw a vision through the storm. A man was rowing a 14-foot long flat-bottomed boat through the crashing waves. The man was Bancroft Bufe, a fisherman from Grand Marais, Michigan, and he was rowing for all he was worth. Bufe had just rescued two men and was headed for shore. But when he saw the Frechette brothers and Holman, he turned course and returned to the floe to add three more souls to the small boat. The wind was fierce and the men’s clothes were freezing to their skin. Chunks of ice were punching holes in the small boat, and while Bufe rowed, the others bailed out water with a wooden box. Oscar Holman tried to relieve Bufe by rowing, but almost lost control of the boat. Bufe, experienced with his boat took back the oars and continued the slow movement towards shore. More than two hours after climbing into Bufe’s boat, Frechette and the others reached the beach at Long Island. With frozen clothes the six men walked along the beach until they reached the warmth of a friend’s shack. “My clothes were frozen so stiff I couldn’t bend my arms, “ he told me. Similar feats of rescue and escape were repeated across the ice floe. Ole Sandstrom and George LaRock of Madeline Island saved themselves by walking in an easterly direction all day on the ice floe until they could get to shore near Saxon Harbor. Amazingly all 29 people who had been caught on the ice floe that day were rescued, or escaped unharmed, although several cars, abandoned by their owners, forever became property of Lake Superior. All the survivors became a part of an incredible story that for years was the staple of local barbershops and taverns around Chequamegon Bay. Vern was the last of that group when I spoke with him, the sole keeper of the story. With a grin on his face and shining eyes, he summed up that day on the ice simply. “Oh, it throws a scare into you,” he said. Vern passed away in 2002 at the age of 93.